We’d love your help. 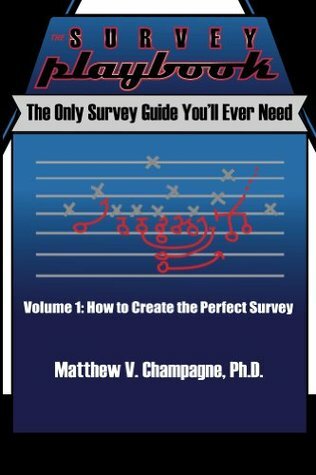 Let us know what’s wrong with this preview of The Survey Playbook by Matthew Champagne. The solutions in this book have been successfully applied at hundreds of colleges and universities, learning organizations, service providers, and trade shows; as well as for surveys of church membership, fund-raising drives, elementary and secondary schools, military training evaluations, political polling, high school sports official ratings, and online focus groups. Any situation where timely and interpretable feedback can improve products and services will benefit from the theory-based and practical advice found in THE SURVEY PLAYBOOK. To ask other readers questions about The Survey Playbook, please sign up.